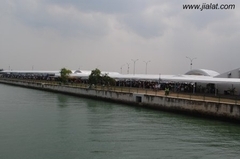 Jialat.com went to the Singapore Airshow and regretted it because of the congestion and crowds. See the report and photos at jialat.com. The traffic jam started maybe 2 or 3 km from the location. The closer we get, the heavier the jam. It was the worst after the bus made the turn into the straight road leading to the venue. We saw many people taking cabs getting off their cabs and walked, and they were faster! But we couldn’t! The bus crawled and crawled and crawled to the designated dropping point. By the time it was already 1230pm. The Black Knights already flying! So, not wanting to waste time going into the venue, we all stood beside the big big longkang to watch. We got to queue again just to go into the place where the ticket house and security gantry are, and later queued to get through the security check. And I realized that, no one checked my ticket! No one! I saw a few staffs checking some other queues, but there were just none doing so for the other queues! Then what the hell I bought the ticket for if I can get in FREE?" Weikiat even drew a detailed aerial view of the queue he went through just to get on the bus to the show. Read his report and see his photos at weikiat.net. "The news said that the huge jam and queue was due to insufficient bus. This is highly laughable. They can easily determine the kind of crowd that is going to turn up before 12.30 for the Air Performance through their outrageous ticket sales (which I highly suspect they sold as many as they want without regards to their catering capacity). The 2 and a half hour queue that I endured was still OK, if not the fact that there were NO CROWD CONTROL IN PLACE until at least about 2hours in the queue when I see some uniformed police personnel appear and tried to maintain some order. 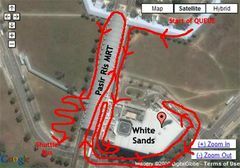 Cutting of queues, something which Singaporeans were remarkably good at, were at its full display at White Sands today. I even shouted at a rude Indian Family to not cut the queue infront of me, and they did not even turn around."